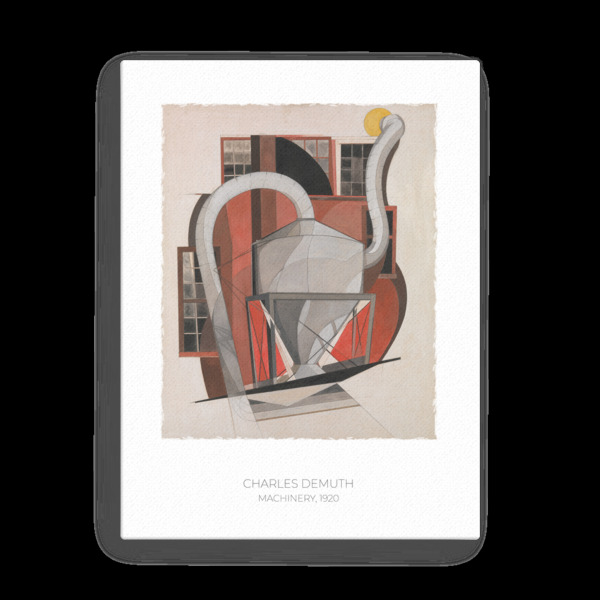 This painting was first shown in an exhibition of Demuth's works titled Arrangements of the American Landscape Forms, held at the Daniel Gallery in New York in 1920. Rather than a traditional landscape scene, it depicts industrial architecture in his hometown of Lancaster, Pennsylvania. Despite some abstract use of force lines and fragmented planes, the subject remains identifiable. It is a scene of rooftop machinery set against a background of windows belonging to an adjacent factory building; the central structure is a cyclone separator, a centrifuge-like apparatus often used in industrial settings, consisting of a tank, a funnel, and two armlike duct pipes. Like Demuth's painting The Figure 5 in Gold (49.59.1), this work was dedicated to his close friend, the poet William Carlos Williams. Williams himself contemplated the analogy between the arts and technology. In 1944, he wrote, "To make two bald statements: There's nothing sentimental about a machine, and: A poem is a small (or large) machine made out of words" (introduction to The Wedge, 1944).